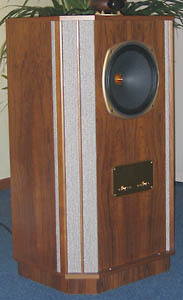 MBL model 101 E large floorstanding a loudspeaker was being used to good effect with their large solid-state amplifier. Making wonderful sounds was the Tannoy Prestige Yorkminster with its adjustable top-mounted supertweeter and 12-inch dual-concentric driver. The main unit has a tweeter centrally mounted, as noted being a dual concentric design. 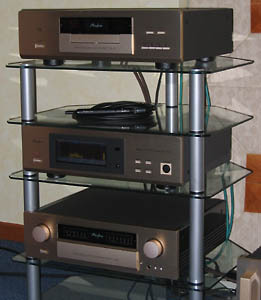 Feeding the Tannoys were Accuphase's DP-67 CD player/transport, DG-38 dual voicing equalizer, C-2400 stereo pre-amplifier, and Accuphase stereo amplifier. 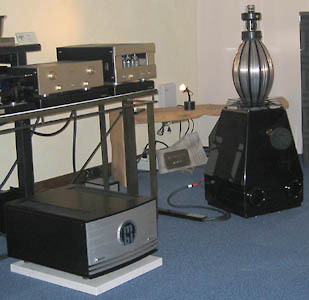 Longstanding audiophile Opus 3 had quite a few releases for sale at the Top Audio & Video Milan show. Loudspeaker Chiro, who regularly crafts elegant solid Walnut (or Cherry) wood cabinets in the finest of traditions, had their Ursa Major (�5,399) large floorstanding loudspeaker. This apparent bargain for such fine looking music reproducer consists of two cabinets. The top one holds the upper frequency units while the lower part contains the subwoofer. 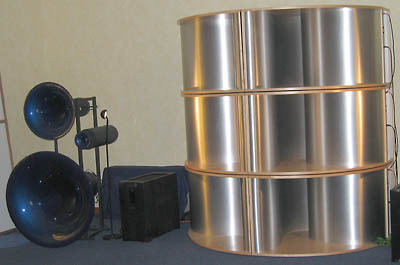 Bi-amplification is possible in this 91dB/W/m loudspeaker. The 1.5-inch tweeter, 5-inch midrange, 6.5-inch woofer and dual 6.5-inch subwoofers together produce frequencies from 35Hz to 20kHz. 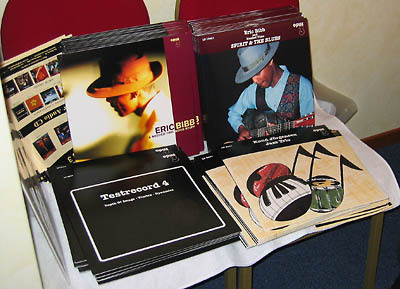 Avantgarde Acoustic was partnered with VTL to drive their Trios including their Basshorn. Avantgarde has garnished many awards including one from yours truly. See my review of their Uno loudspeakers by clicking here. Focal.JMlab's glorious and room-filling Grande Utopia Be deserve a large room to sound their best. Standing nearly 6 feet high and weighing 210 kg. (450 lbs. ), this unit includes a 0.75-inch tweeter, two 6.5-inch midrange, an 11-inch woofer, and impressive 15-inch bass driver. See Enjoy the Music.com's Superior Audio review of this loudspeaker by clicking here.